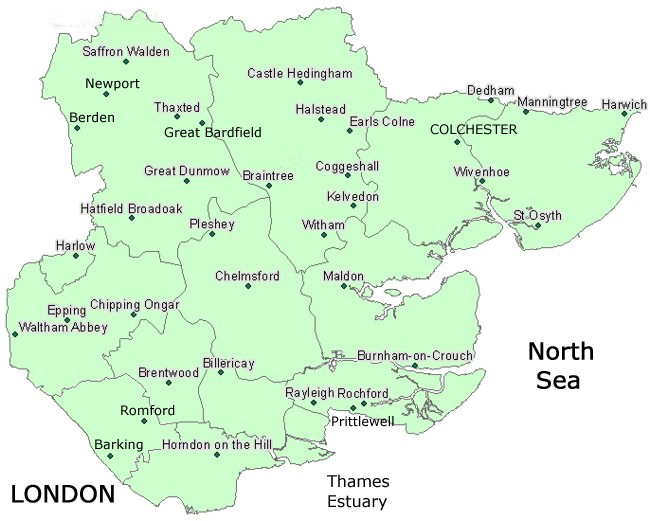 Witham's location, at roughly a midway point between Colchester and Chelmsford, lies in an angle formed by the confluence of the River Blackwater and its tributary, the Brain, at a point where the Roman road connecting London and Colchester crossed the Brain. The highest point of the site is a spur off the east slope of the deeply cut Brain valley, known as Chipping Hill (which remains a district within modern Witham), where are remains of an Iron Age hill-fort; now known as Witham, or Chipping Hill, Camp, this gives a good view over the marshy ground around the Brain. Evidence of minor Roman and Early Saxon settlement has been found at a site about a mile distant, closer to the Roman road  Roman habitations were probably scattered across the area between the road and Witham Camp. During his efforts to re-establish Saxon rule over Essex in 912/13, Edward the Elder, en route to Maldon to establish a fortified base, stopped at Witham  this being the earliest occurrence of the name  and there erected a burh. Its precise location is uncertain: re-use of the hill-fort is one possibility, though the scarcity of Saxon finds there, while showing some occupation at the burh period, does not indicate substantial human presence, and only one habitation (probably the later manor-house) has been identified; another conjecture, based on topographical and cartographic evidence, is a site spanning the through-road, in a neighbourhood known as Wulvesford, closer to the ford across the Brain and utilizing that meandering river as one side of its defences. However, Edward's hastily-erected burh was not necessarily intended to develop into a focus for settlement, nor commercial activity (no mint having been established there), but may have had a primarily defensive purpose, to control land and river routes in any challenge from Danish forces encamped near Colchester. Despite that, the presence of church and adjacent triangular-shaped marketplace, just outside the enclosure, could point to the burh outskirts having become a magnet for habitation in more peaceable times. Late Saxon Witham also became the centre for a like-named (half-)hundred  that is, the location of the hundred's meeting-place  and a royal manor on ancient demesne; Witham Camp is thought to have been used for both. Renovation of the hill-fort defensive ditch in the early thirteenth century has prompted speculation that the site had been redeveloped as a castle, but there is no firm supporting evidence, although at least one of the other manor-houses in the parish was provided with a defensive moat, probably during the Anarchy. The focus of settlement remained Chipping Hill, whose name implies the presence of a market, and the nucleus of settlement seems to have been immediately outside an entrance into the earthwork. Not far outside the hill-fort enclosure, beside what is now the High Street, was built the parish church of St. Nicholas  a dedication that supports belief in the presence of a market  possibly inside a circular, though probably prehistoric, earthwork; most of its fabric represents a fourteenth-century rebuild and enlargement, though there is some evidence of a late twelfth-century nave, and it is not impossible that an older minster church might once have stood on the same site. Domesday shows the parish of Witham divided among several manors, with a total population estimated around 750 [Karen Fielder, Witham Town Centre, Newland Street Conservation Area Appraisal and Management Plan, Essex County Council, 2007, p.4], an unusually large proportion of property-holders being freemen: possibly a legacy of the burh. Domesday gives no evidence for Witham having a market or any urban characteristics, but the same could be said of a number of places falling under this study. Most of the manorial holdings, along with a mill, were owned by Harold Godwinson before the Conquest, and King William thereafter. Yet, shortly after the time of Domesday, a manor at Witham was given to Count Eustace II of Boulogne, husband to the Confessor's sister and, later, ally of the Conqueror; he was, at the time of Domesday, the greatest lay landholder in Essex and Hertfordshire. His lands had previously belonged to various Saxon holders and to the cleric Ingelric, a favoured royal agent, priest of the royal household, and founder (ca.1056) of the London collegiate church of St. Martin-le-Grand, whose endowments were among the lands that passed to Eustace. Witham thereafter superseded Chipping Ongar as the administrative seat of the Honour of Boulogne. From late in the reign of Henry I, the order of the Knights Templar began, initially in the context of fund-raising and recruiting forces for Crusade, to develop interests in England and, over the course of that century, came to acquire extensive landed holdings across the country. The order managed those holdings with a view to generating money that could be used to support its mission in the Holy Land. It also provided a source of financial expertise and support to the monarchy (somewhat like a bank), particularly important during the Anarchy, as well as other services; this is part of the explanation of how they came to acquire so much real estate from royal grants. Like other religious orders, they not only operated manors, but developed them, obtaining licences to assart in order to bring more land under agricultural use, and establishing markets and fairs. While churches they built (dependent on the Temple in London) were often dedicated to St. Mary, St. James (patron saint of Crusaders and pilgrims) was also a not uncommon dedication, and fairs operated by the Templars tended to favour, though only slightly, the festival of the latter saint. Edward I weaned the monarchy off its reliance on Templar services and, with Crusading days over, his son felt able to follow international trends in dissolving the order, keeping some of its real estate, but transferring most to the Hospitallers (dissolved 1540), with much of the membership similarly crossing over. In 1137, King Stephen's wife, Matilda, daughter of Count Eustace III (a particular patron of the Templars), and by now Countess of Boulogne in her own right, showed her support for the Templars by granting them the manor of Cressing, in Witham Hundred (an area of good agricultural land), and the advowson of its church. This was one of the earliest Templar estates in England and became the location of a small Templar preceptory  that is, a base, part monastery, part manor-house, incorporating lodgings, meeting/dining-hall, chapel, farming and industrial facilities, and defensive features. Ca. 1147 Stephen, his queen, and their son gave the Templars the half-hundred and the manor of  perhaps it would be more accurate to say a manor in  Witham, with all its appurtenances except for the church, which Matilda had already given to St. Martin-le-Grand; Cressing lay just a few miles north of Witham, near the same Colchester-London road, and the grant of Witham represented essentially an expansion of the former estate. None of these three charters explicitly mentions a market at Witham, but the Templars may well have been looking to augment their holdings with a market site, where they could obtain, for their preceptory, a supply of goods not produced on their own estates. Ca.1154 Stephen confirmed to the Templars the right to an existing market a Witham, and ordered Richard de Lucy in somewhat stern terms, to ensure the market could be held as freely, fully and peacefully as it had been earlier in his own reign and during the reign of Henry I; [Regesta Regum Anglo-Normannorum 1066-1154, ed. H.A. Cronne and R.H.C. Davis, vol.3 (1968), p.312]. Instructions such as this were normally directed to the pertinent sheriff, an office Richard certainly held in 1156  he going on to serve as Henry II's Chief Justiciar  but perhaps also in the last years of Stephen (for which we lack information on incumbent sheriffs of Essex). It is also possible that he was the addressee of the royal writ because, having just been given the manor of Chipping Ongar, he may have wished to develop it as a market centre, and considered Witham's market a rival; furthermore, he had acquired an interest in the Honour of Boulogne by marrying into that family. Richard I and John, in their turns, issued confirmations of the grant of the half-hundred and manor with market in 1189 and 1199; it was to John's confirmation that the Templars referred when defending (successfully) their possession against the quo warranto proceedings of Edward I's time, for they could produce in court the pertinent documentation and did not have to resort to the "since time immemorial" defence. Witham's seems to have been the first English market owned by the Templars, but not the last. At some point during the reign of Stephen they were granted by Gilbert de Clare, Earl of Pembroke (d.1148), land at a crossroads site within the parish and manor of Weston in Hertfordshire, beside a through-road that had close access to one of the main routes from London to the north (roughly a Roman route later designated Ermine Street, using a Saxon name). According to an early thirteenth century charter of a later earl, "on that land they constructed a certain borough, which is called Baldock, and greatly improved the property beyond its value when acquired" [Dugdale et al., Monasticon Anglicanum, rev. ed., vol.6 (1846), p.820; my translation]; the earl's charter confirmed the Templars' possession of the land and of the borough, along with all improvements made since its acquisition. These improvements included a planned layout of burgage plots, the linkage to the main road north, a central church dedicated to St. Mary (Baldock being made a parish in its own right) and a market, heard of in 1185 and, according to Richard I's confirmation of Templar possessions, granted them by Henry II; a fair licence was obtained in 1199. It has been speculated that the place-name is a rendering of Baghdad [North Hertfordshire District Council. Character Statement for Baldock Conservation Area, 2003, p.8], which the medieval mind considered one of civilization's great marketplaces, and reflected a hope that Baldock would be similarly successful, commercially. Doubtful though that is, and although Baldock never developed much as a borough, its market seems to have performed quite well, out-competing an older market at the Abbot of Westminster's manor of Ashwell, a few miles to the north (but not on a major through-road), where a burghal component had been introduced by the time of Domesday. A second fair at Baldock was obtained in 1226 by a leper hospital on the outskirts of the settlement, although this may not have performed so well, as no more is heard of it. In 1492 the Hospitallers acquired grant of an additional fair and renewed the licences for the older fair and for the market, though changing the latter's day to Fridays. Other market grants in Lincolnshire came from Stephen, for Swinderby Moor, and from Henry II for Temple Bruer (Lincs. ), whose name refers to the Templars' preceptory on heath-land within a manor held by William de Ashby, who founded the preceptory at some point in the 1150s and, soon after, became a member of its fraternity (though Templar communities of resident brethren tended to be quite small). We know of the Thursday market licence from Henry III's reissue in 1259, which changed the day to Wednesday  noting that the original grant had not yet been acted upon  and authorized a fair as well. Like Baldock, Bruer lay close to the line of Ermine Street, but that stretch was no longer a proper road. Thanks partly to trade in wool from the sheep raised on its lands, the preceptory became one of the wealthiest Templar houses in England, but its remains stand, isolated, on what is now farmland, and the fate of its market (along with any civil settlement around it) is obscure. Temple Balsall (Warks.) was the location of another preceptory, of comparable antiquity to Temple Bruer, on a site donated by Roger de Mowbray, founder of the great baronial house of that name, before 1185  though the Templars did not until 1268 take out a licence for market and two fairs. The site was not well-placed within the communications system and neither its commercial institutions nor the scattered settlement in the vicinity seem to have amounted to much, although in 1466 we hear of a burgage property in Balsall Street, one of the parish's hamlets, whose name might point to the location of the market. Roger de Mowbray (ca.1120-88) held extensive estates, is credited as builder of numerous churches, was benefactor to religious orders other than the Templars, and was also an active Crusader. His possessions included a market at Thirsk on the edge of the North York Moors, positioned on a tributary of the River Swale and on a road connecting York and Yarm (a small port on the Tees); Roger had grown up at Thirsk. Settlement there was initially focused around a Mowbray castle razed to the ground in 1176, because Roger had supported a revolt against Henry II. But this was after a new town had been founded within the manor, probably by Roger when a young man, for in 1145 his endowments of the Augustinian canons of Newburgh Priory, which he had just founded and which was dedicated to St. Mary, included: the advowsons of Thirsk's parish church of St. Mary, and of a chapel dedicated to St. James built (again probably by Roger) to service settlers around the green that served as Thirsk's marketplace; and various agricultural lands, some of which were said to be in the borough there (later known, somewhat incongruously, as Old Thirsk). His foundation charter continued: "I grant them, and their men who reside in the borough of Thirsk, all liberties and exemptions which my burgesses have in that borough when buying and selling, both in the market and outside the market, so that they need pay neither toll nor stallage" [Monasticon, vol.6, p.318; my translation]. Since the priory was some eight miles south-east of Thirsk, there is no obvious association between its name and the Mowbray new town foundation at the latter; but the coincidence is curious and may reflect some conceptual linkage in the mind of the founder, who likely envisaged Thirsk as the market centre serving the needs of the priory, without impinging on the latter's desire for isolation from the noise and temptations of commercial activity  after a visitation in 1275, the archbishop of York criticized the cellarer for dealing in horses, like a merchant, which exposed him to the risk of the sin inherent in commerce, and this warning was extended to all the priory officials, yet a later visitation (1318) still found there was too much interaction with laypersons who were frequenting the cloisters and other parts of the priory. Evidently Thirsk's market and borough existed before 1145, and neither Roger nor his descendants felt the need to take out a formal licence, which also suggests a long-standing market, but the foundation of a market town had likely taken place within the previous decade. At the quo warranto proceedings of 1293 Roger's like-named grandson claimed that his family had held markets and fairs at both Thirsk and Burton in Lonsdale (in another region of Yorkshire), without interruption, since time immemorial  a claim that was to be tested by a jury inquisition  and a Thursday market and August fair at Hovingham (about 15 miles south-east of Thirsk (of which manor it was an outlying member) by right of a royal licence (1252), which was presented into evidence and read into the record. In the case of Hovingham the king's attorney argued that Roger, notwithstanding his licence, did not actually hold market or fair events when he was supposed to, to which Roger replied that the vill lay in a largely unpopulated area and that when men of the vicinity wished to conduct commerce they were likely to do so on Mondays, while fairs similarly took place only when there was local demand for one. Hovingham's was clearly a market primarily serving the manor and its residents, rather than catering to long-distance traders  even York being some eighteen miles away. Thirsk's market was a Monday event (as was Burton's, unlicensed until 1307) and is likely to have deprived Hovingham of some potential long-distance business. By the time of the post mortem on Roger's son, John, (1327) two other fairs had come into existence at Thirsk (one at St. James' day), though there we have no record of either being licensed. Roger I de Mowbray makes another appearance, in connection with a Templar market at South Cave (Yorks. ), which lay beside a road, possibly of Roman origins, connecting Market Weighton (its market licensed 1252), in the interior of the East Riding, with the Archbishop of York's foundation of the market town of Brough  chartered as a borough and its market licensed in 1239  on the north bank of the wide Humber river, Yorkshire's great commercial highway. There is some indication of a market at South Cave in the twelfth century  it had perhaps originated even earlier as a hundredal market  though our first reference to it is in the latter half of Henry II's reign, when Roger de Mowbray granted tenancy of the manor, with its market, to Roger d'Eyvill  identified, in the witness list to Mowbray's endowment of Newburgh, as his steward. D'Eyvill, in 1253, gave to the Templars the market and a fair, both of which he claimed to have by royal grant; this implies he had purchased a licence, but the first one known for certain to us was that acquired by the Templars  although their preceptory was some distance away, on land donated by Roger de Mowbray (ca.1185) at Faxfleet, which gave the Templars immediate access to the Humber, and thereby to maritime commerce  in 1291, by which period the place could also be referred to as Market Cave. Peter d'Eyvill paid 40s. to renew this licence in his own name in 1314, following the suppression of the Templars, but in 1397 an inquisition found that Thomas d'Eyvill had, some twenty years earlier, granted the market and fair, said to have been held on Templar land and be worth 6 marks annually, to Sir Thomas de Metham, without either Thomas d'Eyvill holding a licence (which appears erroneous, and d'Eyvill counter-argued that he held by hereditary right, as Peter's great-grandson) or Metham renewing the royal licence during his tenure (the Mowbrays still being mesne lords of the manor at this time, but the Mowbray heir a minor in the king's ward, so that the market and fair had been taken into the king's hands). A judicial hearing in 1400 confirmed the legitimacy of Peter's tenure of manor, market, and fair. [John George Hall, The History of South Cave and of Other Parishes in the East Riding of the County of York, Hull, 1892, pp.5-7]. The markets at Weighton and Brough do not seem to have had lasting success, but that of South Cave survived to the nineteenth century, serving mainly for the sale of agricultural produce. A John D'Eyvill in 1220 licensed a market at Adlingfleet, which lay close to the west bank of the River Trent just before it emptied into the Humber, but it is not certain if he was a member of the same family. In Yorkshire's West Riding the Templars acquired licence for a Tuesday market and June fair at Walshford in 1227, paying the relatively large licensing fee of £10; the sheriff of Yorkshire was ordered to make public proclamation of the licence. Situated on or close to the same route between London and the north which benefited Witham, much further south, and also on the River Nidd, a tributary of the Ouse, Walshford was a vill within the manor of Ribston which, along with Walshford, had been granted to the Templars before 1224 by Robert de Ros to establish or enlarge a preceptory further along the Nidd bank; Robert de Ros  like Roger de Mowbray, a one-time Crusader  was a former sheriff of Cumberland and a commander of his branch of the Templars, though it is hard to differentiate father and son of the same name. It was presumably intended that Walshford function as the market serving the preceptory brethren and other parish residents; there the Templars erected a chapel, subservient to their cell at Ribston, though it is not known if this initiative was contemporary with the market licence. Yet it seems that Walshford's commercial performance was not satisfactory for some reason. Perhaps the borough of Knaresborough offered too much commercial competition. Three miles to the north-west of Walshford, and in a strategic position protecting a crossing point on the Nidd, Knaresborough had a Wednesday market (existing since at least the beginning of the thirteenth century) held in the shadow of a Norman castle, and a July fair; both were confirmed by Edward II to his favourite, Piers Gaveston, in a charter of 1310 that also recognized liber burgus status for Knaresborough. So in 1240 the Templars of Ribston exchanged their Walshford licence for one applicable to Wetherby, three miles further south, another property that de Ros had donated to the order; at its new location the market was altered to a Thursday event and the fair moved to a July date that would have made it more attractive to long-distance traders travelling to the Knaresborough fair. Wetherby lay at a nodal point within different landscapes  in a well-wooded valley with water meadows, on the boundary between the agricultural vale of York and the Yorkshire Dales  thus giving it access to a range of economic pursuits and of raw materials for commerce; it was situated on the same route from London as was Walshford, and at a crossing-point of the River Wharfe. Its layout focused on the marketplace, into which minor roads were channelled. The relocation occasioned a complaint of competitive damage in 1242 from the owner of a market at Harewood (licensed 1209 as a Saturday event), five miles south-west of Wetherby, but she, daughter of the original licensee and widow of an earl of Devon, reached an amicable settlement with the Templars and Harewood's market is later evidenced as taking place on Mondays. Wetherby's market and fair endured and performed well enough; despite damage Wetherby suffered from Scottish marauders following the English defeat at Bannockburn, the settlement recovered and by the late fourteenth century we see evidence of sufficient occupational diversity to assure its economic well-being for a while longer. However, in 1306 the Templars received a licence for a Wednesday market and July fair for their manor of Gaddesby, in place of the Rothley institutions. Gaddesby lay eight miles to the east of Rothley and was one of the geographically closest dependent members of its soke, just as its chapel was dependent on Rothley's church, but in the same parish. The Templars had held at least a grange at Gaddesby since the beginning of the century, having acquired the king's share of manorial rights there when Henry III granted them the soke of Rothley. Perhaps the choice of Gaddesby as a new location for the market was because it was the second most populous vill (after Rothley) in the soke, in terms of rent-paying tenants, though surname evidence does not suggest any occupational diversity beyond what might be expected in rural settlements, and certainly gives no indication that either might be proto-urban [Vanessa McLoughlin, "Medieval Rothley: Manor, soke and parish", Transactions of the Leicestershire Archaeological and Historical Society, vol. 81 (2007), pp.73-75,78-79]. The reason for the market substitution was not stated, but it does not seem related to the crackdown on the Templars, which did not begin for another couple of years, though perhaps they had an intimation of what was to happen. Although Rothley soke as a whole may initially have been a lucrative property for the Templars, possibly they were in the process of making adjustments within it, subsequent to a survey of the soke and valuation of its assets drawn up in the mid-thirteenth century; that document does not refer to the market, which might mean it was not one of the more valuable assets of the soke. By 1338, when an extent of the Hospitallers' estates was made, the soke was operating at a loss, although perhaps this was due to neglect and partial dismantlement during the hiatus years prior to the handover of Templar property. Yet it may have been that Rothley's market, sandwiched between those of Leicester (a Domesday borough) and Loughborough (licensed 1221 for Thursdays), but not directly on the land traffic route between them, had a hard time attracting business and establishing a niche in regional commerce. Competition intensified in 1292 when Mountsorrel, immediately north of Rothley, planted on assarted land and containing a burghal component, received a licence for a Monday market and a fair to be held about two weeks after that of Rothley. That no complaint of detrimental competition from Mountsorrel is heard of may be because the licensee was Nicholas de Seagrave, a newly-minted but influential baron, and at least some of the burgages were held of the earls of Chester and Leicester. Gaddesby was away from the route between those two larger markets  a disadvantage that would have been less significant if Gaddesby's market were primarily targeted at a local population. On the other hand, the Templars found themselves beset by difficulties in Rothley. They had problems with the terms of the grant of Rothley soke, necessitating a reissue in 1235, and were not able to obtain possession of all lands of the soke until 1237. They were in contention with their Rothley tenants, who, before the grant to the Templars, had possessed those liberties associated with free tenants of ancient demesne, as well as an opportunity to hold the vill at fee-farm, and found the Templars, who had introduced increments to traditional rents in parts of the soke (though not Rothley manor proper), a less tractable seigneur than the king  in 1284 a case before the eyre justices involved several tenants versus the Templars over whether the former owed suit and service (as jurors) to the soke court, which had implications as to whether they were of free status or not. There was also a problem relating to an accusation of illegal assarts, while in 1276 the king back-pedalled on his concession of the Rothley advowson to the Templars [Hamilton Thompson et al., "The history of Rothley," Transactions of the Leicestershire Archaeological and Historical Society, vol. 12 (1921-22), pp.35-45; Albert Herbert and George Farnham, "Gaddesby," ibid, vol.13 (1923-24), pp.257-260]. These factors may have combined, perhaps with other issues of which we are unaware, to make Rothley an unpalatable base for the Templars; or it may be that Gaddesby seemed to offer more promise as a development site [Vanessa McLoughlin Medieval Rothley, Leicestershire: manor soke and parish, University of Leicester PhD thesis, 2006, p.66]. Whatever the case, the Templars' commercial institutions show some sign of initial success in their new location at Gaddesby, whose area had rich soil for agriculture and good pasturage for raising sheep. McLoughlin [loc. cit.] speculated, from lack of reference to Gaddesby's market or fair in the sheriff's return for 1308, that they had either failed or not yet been implemented; it would seem too soon to abandon them, and the latter possibility seems more likely, considering that the single village street was given a back lane parallel to its west side, possibly suggesting the layout and letting of new plots to augment potential of the local economy, which was probably based primarily on the wool trade. However, matters may have been complicated by suppression of the Templars and delays in turning their lands over to the Hospitallers. Gaddesby had a twelfth-century chapel that was dependent on Rothley church, but the chapel served a large area and was permitted to conduct the sacraments and have burial rights; in the 1240s the Templars had attempted, unsuccessfully, to sever Gaddesby chapel's dependence on Rothley, but that century saw an impressive enlargement of the church, a reflection of local prosperity  though possibly that of various large land-owners at Gaddesby, not just, or even predominantly, the Templars  deriving principally from the wool trade; building improvements continued into the fourteenth century before coming to a seemingly abrupt halt, for reasons uncertain. Gaddesby's assessment in the 1334 subsidy was noticeably higher than that of Rothley, but it seems not to have been able to sustain its prosperity through the Late Middle Ages; the list of residents in the 1377 poll tax does not give an impression of much occupational diversity. The move to Gaddesby may have distanced the Templars' market from those of Leicester and Loughborough, but it was now less than seven miles away from the river-crossing settlement, well-placed within the road system, of Melton Mowbray  the prefix indicating its central position (middle tun) within a group of villages in the Wreake Valley, the suffix named for Roger de Mowbray, who was lord of the manor ca. 1185. Melton Mowbray's flourishing market was felt worthy of mention in Domesday and received royal confirmation as a Tuesday event in 1324; the place later acquired a burghal component and a lengthy August fair which attracted traders from throughout the Midlands and Yorkshire. Given the wealth, membership, widespread holdings, and relatively high organizational level of the order, it is perhaps surprising the Templars are not known to be associated with more markets. Some of their properties may, however, have been developed by others. An example of this is a manor at Strood (Kent), on the opposite side of the River Medway from Rochester; given to the Templars around 1159/60, it was at first developed to provide accommodation for travelling brothers. But it was rather Gilbert de Glanville, Bishop of Rochester, acting on behalf of a monastic hospital, who fostered the economy of Strood, making it a parish in its own right (independent of neighbouring Findsbury) in 1193, acquiring a fair licence in 1205, and building wharf facilities there. The Hospitallers took over most of the Templars' markets, but were no more active than their predecessors in establishing new markets. Nor did the Hospitallers do much with the decaying preceptory at Cressing-Witham, making little use of it and eventually amalgamating the estate, administratively, with that of Temple Bruer. Taking the above into consideration, it may well have been the Templars who introduced at Chipping Hill, in the years following the grant to them of Witham, a small planned development outside the north-western entrance to the hill-fort, around Church Street, at the southern end of which is the aforementioned triangular area (at a junction of roads) interpreted as a marketplace; however, the degree of planning is uncertain, and may have entailed only an expansion, or re-organization, of the older Saxon settlement. Stephen's confirmation to the Witham Templars provides further support for the assumption that Chipping Hill was the location of a pre-licensing period market, though one more geared to, Richard Britnell ["The Making of Witham", History Studies, vol.1 (1968), p.14] believed, producers and consumers of the hundred, rather than long-distance traders using the Colchester-London road, which did not pass close to the market, or the rivers system  nearby Maldon offering a better port. A manorial survey of 1185 indicates shops could be found in that marketplace, though these may not have been much more than covered stalls; but only a modicum of occupational diversity is revealed by tenants' by-names, while only one name points to an individual living off commerce. Furthermore, operation of the market was being farmed out by the Templars for 60s., which suggests the yield from tolls and stallage could not be relied on to generate a superior amount. Stephen's cursory confirmation of Witham's market does not incorporate any early version of the anti-competition proviso, but it does have an odd instruction to Richard de Lucy to take care, in ensuring the Templars were able to hold their market, that neither Baldwin de Rochester nor anyone else, lost anything by it. Britnell ["English Markets and Royal Administration before 1200" Economic History Review, 2nd ser., vol.31 (1978), p.185] suspected that the explicit confirmation of the market, coming several years after the grant of the manor, had been sought by the Templars because of some objection this Baldwin had to Witham's market, which had not been explicitly acknowledged in the earlier grants of Stephen and Matilda. Unfortunately it is not clear who Baldwin was, though the name was common in the Boulogne family  all I find of him is that he held lands in Cambridgeshire  and there is no record of him being a market-owner anywhere. Were he legitimately such, and assuming Baldwin's market to have been in the same region as Witham's, de Lucy's only option would have been to shift the Witham market to a different week-day. The confirmation does not state on which day markets were to be held at Witham; but when, in the early years of Edward II, Templar properties were transferred to the Hospitallers and in that context underwent a survey (1309), Witham's market was said to be a Tuesday event, and we also hear of two fairs, in early and late August; however, in 1219 Tuesday had been substituted for Sunday, the latter day lending support to the case for the antiquity of the market. By that date the Templars had shifted the focus of development at Witham south-eastwards from Chipping Hill, to a stretch of the London-Colchester road in the Wulvesford neighbourhood, subsequently known as Newland Street,  still the focus of the modern town centre  and had acquired in 1212 a formal licence for a Thursday market and short August fair at "their new town of Wulvesford" [T. Hardy, ed. Rotuli Chartarum in Turri Londinensi asservati London, 1837, p.188], though it was as Newland  a somewhat generic name given to undeveloped land, such as forest, heath, scrub, or marsh, opened up to better use (normally residential or agricultural)  that the Templars referred to their foundation; there is no hint of any such settlement in the 1185 manorial survey, and King John's confirmation in 1214 of the Templars' holding of Newland seems to add strength to the notion that a new area within Witham manor had been brought under development. When he came of age, Henry III confirmed the market licence. The older settlement at Chipping Hill  manorial court rolls of the fourteenth century referring to the 'old market' there  evidently continued as a residential area with market, implied in references to the 'new market' during the reigns of Henry III and Edward I. The latter (1285) reference was the transfer, by final concord, of a messuage and three-quarters of an acre of land in Witham, and the grantor was identified as John Page of the new market of Witham, an individual documented a couple of decades earlier as resident of one of the half-acre plots of Newland, while other evidence indicates him to have been a prospering salt-trader; a William le Page and his wife had quitclaimed their right in a Witham messuage in1240. But possibly we see the end of the Chipping Hill market in 1379, when Richard II granted the prior of the English order of Hospitallers a Tuesday market at Newland, within the manor of Witham, in lieu of an existing Tuesday market there  presumably that at Chipping Hill. This likely indicates that the Newland market was doing good business; the various types of income from Newland amounted to £8-9 a year in the late thirteenth century  a better return than would have been generated had Newland been left as arable land [Britnell, op.cit., pp.16-17; Mark Bailey, "Trade and towns in medieval England: new insights from familiar sources," The Local Historian, vol.29 (1999), p.199]. Witham's markets were not so lucrative, however, as to make them invulnerable to subversive trends: the Chipping Hill marketplace had largely been infilled by the end of the Middle Ages, whereas the Newland market was slower to fall victim to that trend. We may wonder whether the Templars really expected that their new market at Witham could capture a significant and enduring share of regional trade, given that it was ringed by better-established markets at Colchester, Chelmsford, Maldon, and Braintree; but it was perhaps precisely the increase in long-distance commerce that such market centres had stimulated in the region which the Templars hoped to take advantage of, and it would be another century before a direct competitor arose in the Thursday market at nearby Kelvedon. In this venture at Witham the Templars seem to have had some success. By the opening of Edward I's reign Witham hundred was being farmed out for twice the amount it had customarily yielded in earlier times, although its farmer, the hundred bailiff, may have been raising the amount of the farm through questionable administrative practices, to judge from the complaints against him laid by the hundred jury. Newland's early prosperity doubtless owed much to the more advantageous location of its market, at a time when the proliferation of markets along the roads to Colchester was helping build commercial travel. The Newland market took place in the long, straight through-road, part of which (at the crest of the rise) was widened for that purpose; we may suspect that this was the 'plot' of land, one perch wide by fifteen long, in Newland that an escheator had seized into the king's hand a little before 1337, on the belief that it had been encroached from the king's highway or acquired contrary to the Statute of Mortmain, a charge countered by an inquisition jury that supported the Hospitallers' claim that it had always been parcel of the Templars' manor. Into this marketplace ran a route from Maldon and another from Braintree, the latter first passing through Chipping Hill then continuing as Church Street; the through-road continued past the market, south-westwards to the Brain crossing. In 1320 we hear of two crosses within the street, marking the official limits of the marketplace, though these were probably put in place soon after 1212; one was superseded by a market house, but perhaps not until the sixteenth century. Newland was better situated than the Chipping Hill market to capture a share of long-distance commerce, and its placement would enable it to serve as a stopping-point for coach travellers in a later period  though this role was not without medieval precedent, for in 1320 we hear of three carters, transporting goods of the king, who found overnight accommodations at a Witham inn for themselves, two carts and eleven horses, only to be waylaid by the innkeeper and accomplices, who appropriated the goods and the carts. About sixty plots, most of them a half-acre in size and with a 3:1 ratio of depth to width  the relatively generous width allowing houses to be built parallel to, rather than end-on, the street [M.R. Petchey, "The archaeology of Essex Towns," in The Archaeology of Essex to AD 1500, Council for British Archaeology Research Report No 34 (1980), p.116]  though any original uniformity gradually disappeared as plots were amalgamated or sub-divided  were laid out along both sides of the street (the boundaries of some can still be made out) and offered at a standardized rent. Despite Wright's assertion that "In old writings it is sometimes called the burgh of Witham" [The History and Topography of the County of Essex, London, 1835, vol.1, p.215] there was no known explicit foundation of a town, and we have no reference to the Newland plots as burgages, nor their tenants as burgesses; but the aim was undoubtedly to attract tenants wishing to live marketside and pursue a livelihood not dependent on agricultural or pastoral activity  Witham's status as royal demesne would have limited servile obligations from its inhabitants, though those of Chipping Hill are documented as owing some labour services, whereas Newland tenants owed only rents. Few of the tenants listed in a survey of ca. 1258 held additional land sufficient for earning a living by agriculture, and of those who did, half were customary tenants [Britnell, op.cit., p.17] A back lane along rears of plots on the south-east can be made out on a map of 1839, and a market chapel seems have been built for the convenience of Newland residents, the parish church being about a half-mile away. A survey of the 1260s indicates that most plots had found tenants, though some were said not to have been built on, and archaeology has cast doubt on whether a few of the plots ever came into use  proximity to the flood-plain perhaps deterring takers; by the time of the survey almost a third of the new building plots were yielding additional rents from extensions used as shops, their varying rents reflecting differing characters (from counters hung down before house-fronts, to enclosed chambers). Newland's tenants at this time demonstrate a wider range of occupations than had earlier been shown at Chipping Hill, including leather-workers, cloth finishers, chapmen, victuallers, and men engaged in building industries  nothing out of the ordinary for a small market town (i.e. agriculture-derived industry and commerce), with the possible exceptions of a salter and an ointment-seller, both specialized fields of mercantile activity. The Newland rents represent more than half of the Templars' income from their foundation, with judicial jurisdiction generating about a quarter of the total, and market tolls half of that again. This burghal component  if such it was, for so it appears  did not extend beyond the ribbon development along the through-road, except perhaps a little along the minor road connecting it to the Chipping Hill settlement; it is almost over-dignifying it to describe it as a new town, future growth remaining slow and modest until the modern era. Despite proximity to the great cloth production and marketing centre of Colchester, there is evidence of cloth manufacture  primarily finishing trades  in late medieval Witham, and a fulling mill operated there for at least a short period in the opening years of Edward II's reign, but its derelict condition by 1309 suggests the local cloth trade had faltered. Witham did not, until the post-medieval period, become one of the most notable Essex centres of the industry, yet it was sufficiently productive that London cloth-dealers were beginning to acquire property there in the late fourteenth century, and increased financial interaction between Witham cloth-finishers and London tradesmen is evidenced at the same period, though both phenomena are less pronounced than at other Essex towns.